Howard Deering Johnson had very humble beginnings in the food service business. Although he is mostly known for his motel, hotel, and restaurant chains, it was his branded ice cream that gave him a spectacular start in the business. In the 1950s, Howard Johnson's restaurants dotted the American landscape, and travelers came to depend on the restaurants' consistency. This new way of doing business, called franchising, was perfected by the chain's founder, Howard Dearing Johnson. debts in 1924. Johnson then borrowed $2,000 to buy a small corner drugstore and soda fountain in Wollaston, Massachusetts. He sold candy, newspapers, cigars, and medicine—and he was very successful. The popularity of the soda fountain convinced him that having better-tasting ice cream would boost his business. At first, he used his mother's recipe. Not satisfied with this, he invested $300 in an ice cream recipe from an elderly German immigrant who was retiring. This premium ice cream recipe utilized natural flavors and twice the normal level of butterfat. Johnson began with three flavors, eventually increasing this to twenty-eight flavors. He also sold his ice cream at local beaches to boost business. A local restaurant owner who purchased ice cream from the drug store asked to use the Howard Johnson name on his restaurant. Johnson agreed, which made him the exclusive source of supplies. The restaurant combined a lunch counter, fast-food takeout, an ice cream stand, and a sit-down restaurant—all in one location. Johnson soon began selling franchises of his restaurants. The white buildings trimmed with orange and sea blue became the Howard Johnson trademarks. Johnson was very effective in maintaining quality control. At a Howard Johnson establishment, one could expect cleanliness and hospitality. The waitresses were hired for their courtesy, and high chairs were available for children at all restaurants, along with meal portions especially for children. 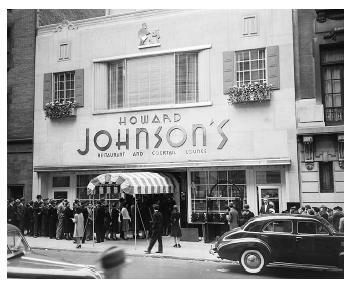 By 1940, Johnson had about 135 restaurants. During World War II, 90 percent of the restaurants closed due to gas rationing. The industrious Johnson contracted to manufacture candy and other goods for the armed forces. After the war, he began expanding his chains nationwide. More Americans were beginning to travel, and Johnson saw a need for better quality motels and hotels to meet the needs of these travelers and their families. Johnson created motor hotels, offering good services and cleanliness. By 1965, the Howard Johnson name was to be found on 770 restaurants and 265 motor hotels. Howard Johnson retired in 1959, leaving the company to his son. However, he continued to monitor his restaurants for cleanliness and proper food preparation, often performing unannounced inspections. Howard Johnson's Restaurant's Smart Meals are based on the federal government's Dietary Guidelines for Americans. They rank lower in fat, calories , cholesterol , and sodium than traditional fast-food meals. The nutrition information is always clearly visible on the menu, so that diners are aware of what they are eating. As of 2002, only fifteen Howard Johnson restaurants and two ice cream shops remain in the United States and Puerto Rico, mainly due to increased competition from fast-food restaurants and their low prices. Menu items and the original-recipe ice cream can still be purchased in various supermarkets and in all Howard Johnson restaurants. There are nearly five hundred hotels in fourteen countries. In the 1980s, the restaurant chain separated from the franchised hotels when the Howard Johnson Corporation was sold to other corporations. In addition, the contract that had allowed Howard Johnson to be the "King of the Road" expired and was not renewed. This allowed fast-food chains to claim space on the nation's highways and turnpikes. Nevertheless, Howard Johnson made it possible for travelers and families on the go to eat nutritiously and enjoy a higher standard in all aspects of hospitality than was previously available. SEE ALSO Dietary Trends, American ; Fast Foods . "Hitting the Road Healthfully." (1994). Tufts University Diet and Nutrition Letter. 12(5):7. Lavine, S. A. (1965). Famous Merchants. New York: Dodd Mead.